Mountain Vacation Cabin in the North Carolina Smoky, Smokey Mountains. Robbinsville, Graham County. Lake Fontana, Lake Santeetlah area. North Carolina Mountain romantic, cozy, honeymoon, anniversary, family vacation cabin rentals. NC honeymoon vacation chalet, cabins for rent for your honeymoon or romantic weekend. Honeymoon chalets, cabins for rent in North Carolina. NC Cabin rentals on or close to Lake Santeetlah and Fontana and trout fishing, Family and honeymoon lakefront log cabins near Joyce Kilmer Forest, Smoky, Smokey Mountain National Park, Nantahala River Outdoor Center NOC white water rafting. North Carolina Mountain View vacation chalets homes and cabins for rent by owner. Robbinsville, Graham County NC Vacation Rental Listings. North Carolina Mountain Vacation Cabin, Chalet, Log Lake Homes for Rent. NC Smoky, Smokey Mountain Vacation Cabin Rentals. Hardigree House - 2BR, 2BA, Max 4 Guests. Lake Santeetlah Deep Water Lakefront Vacation Cabin Home with Dock for Rent in the North Carolina Smokey Mountains. Hawker House - 3BR, 2BA, Max 6 Guests. Lake Santeetlah Lake Front Vacation Cabin Home with Private Dock for Rent in the North Carolina Smokey Mountains. Shope House - 3BR, 2BA, Max 6 Guests. Lake Santeetlah Lake Front Vacation Cabin Home with Dock for Rent in the North Carolina Smokey Mountains. Snowbird Creekside Cabin - 2BR + Loft, 2BA, Max 8 Guests. Snowbird Creek side Vacation Cabin for Rent in the North Carolina Smoky Mountains. These Smokey Mountain Vacation Rental Cabins are near Nantahala River Gorge White Water Rafting, Nantahala Outdoor Center NOC, Nantahala River and Lake Nantahala River trout stream fly fishing, USFS Forest Service Tsali Recreation Area Mountain Bike Trails, Appalachian Trail hiking, Joyce Kilmer Memorial Forest, Lake Santeetlah, Lake Fontana and Fontana Dam, Great Smoky Mountains National Park, Cades Cove, Great Smoky Mountains Railroad Excursions Train, Cherokee Indian Reservation, Cherokee Harrah's Casino. 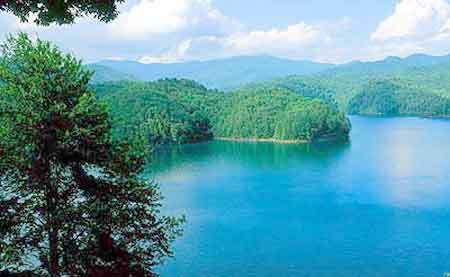 Lake Santeetlah reservoir is located in Graham County and surrounded by the Cheoah District of the Nantahala National Forest. 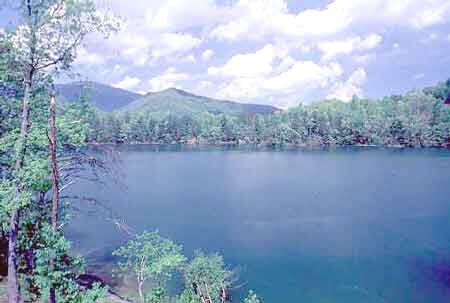 While the Lake Santeetlah surface and land below the high water level is owned and managed by Tapoco, Inc., almost 80 percent of shoreline is public land managed by the Forest Service. Santeetlah Lake has a wide variety of fish including smallmouth bass, largemouth bass, and walleye. Formerly, Lake Santeetlah was the home of the state record largemouth and walleye. 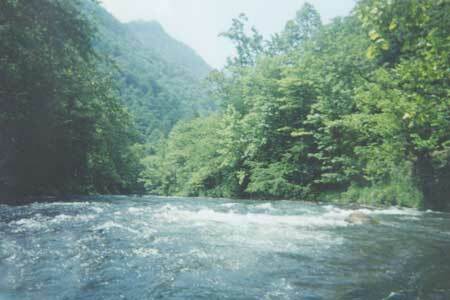 Santeetlah also has a good population of crappie, sunfish, and trout. Access to Lake Santeetlah: From Robbinsville follow Hwy 129 North to Santeetlah Reservoir. Follow signs to boating and fishing access areas. Cheoah Point on Lake Santeetlah is located approximately 7 miles from Robbinsville on Hwy 129 North. Turn left at sign and go 0.8 miles to Cheoah Point. Cheoah Point is open all year around and offers a swimming beach, tent and trailer campground with restrooms and water and picnic area. This campground is offered on a first come first serve basis and there is a fee required for overnight stay. The Nantahala River, located in the USFS Nantahala National Forest, is one of America's favorite whitewater playgrounds. The Nantahala River's ideal location at the edge of the Great Smoky Mountains National Park, close to Atlanta GA, Knoxville TN, Greenville SC, Asheville NC and just a short distance from Murphy, Andrews, Robbinsville, Franklin, Cherokee and Bryson City, NC makes the Nantahala River convenient to Smoky Mountain vacationers.